1) Plastic coffee cups (with lids)-- I ordered mine from Amazon. It was a little pricey--but I really got enough to last 2 years! I've also heard that some coffee places will donate these cups to teachers for free-- so it may be worth inquiring! Just make sure it's the kind for iced coffee and has a hole in the lid! 2) Shredded white crinkle paper-- I bought a few packs from my local Dollar Tree. You can still find this on Amazon though. You also don't have to use white, but I wanted mine to resemble whipped cream. 3) Suckers-- I used different colored Tootsie Roll Pops (because a bag of just red cost a little more than I was willing to pay). You could easily use Blow Pops too. I bought my suckers in a large quantity from Walmart. 4) Pencils-- I use pencils to look like the "straws"-- I found some cute rainbow ones at Walmart for very cheap! 6) Full page label paper (or sticker paper). I purchase mine from Amazon-- but I believe label paper is cheaper than sticker paper. You will need this type of paper to make the stickers for the cups! 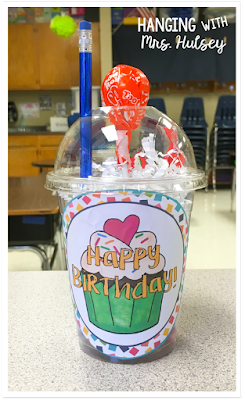 Fill each cup with desired goodies/candy-- leave a little space at the top for the white crinkle paper! Now you are ready for the year ahead! 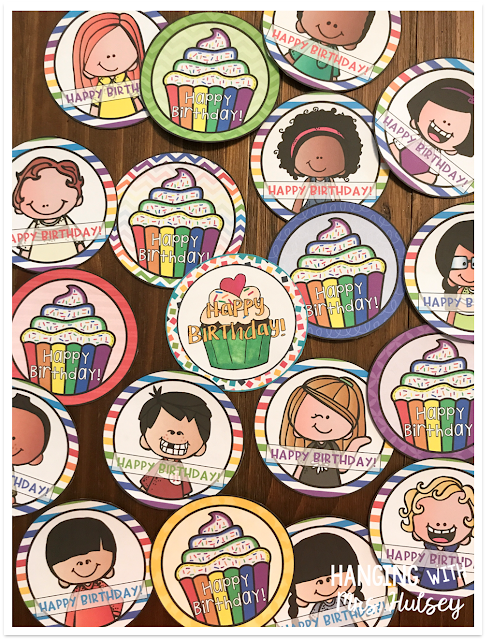 Here is a quick post about how I keep track of student birthdays-- if you need help remembering! 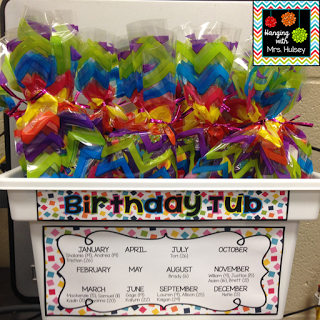 Plus it's a fun way to store birthday gifts! I hope you found this to be helpful! Best of luck in preparing for next year!